I am a sucker for no bake Christmas cookies…ok all cookies. Cookies are life! Nothing says Christmas like Christmas cookies and nothing is better than a no bake Christmas cookie! 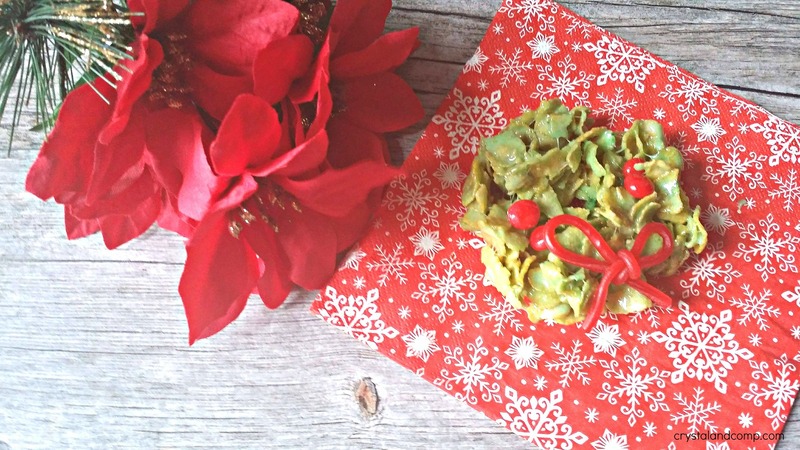 Have you ever made no bake Christmas wreath cookies? Seriously the easiest! The problem is that they are totally addicting. I am not kidding! So if you need a quick cookie to take to your family Christmas gathering or maybe a treat for Santa these cookies are it! This is an easy cookie to make but because of the melted marshmallows things can get sticky. 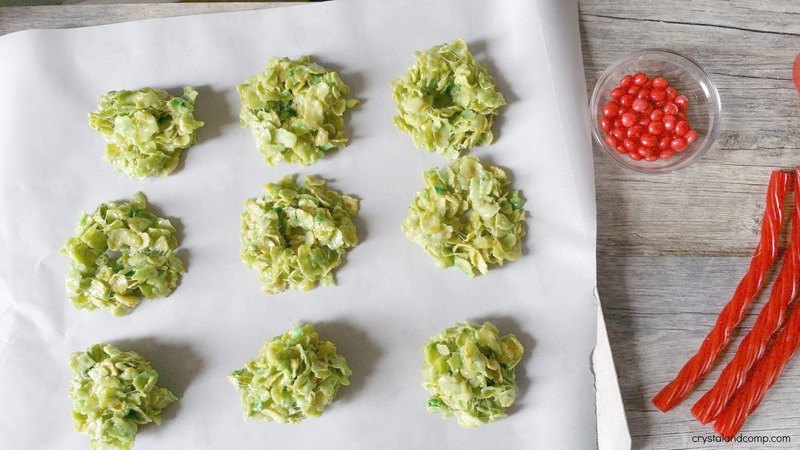 So first place your parchment paper on a cookie sheet. Melt your stick of butter and the marshmallows in a large pot on your stove top. 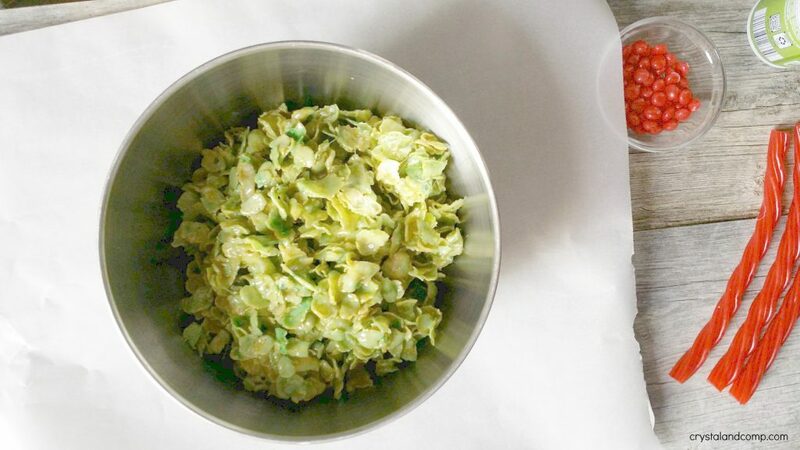 Then add in a few drops of food coloring to make it green. 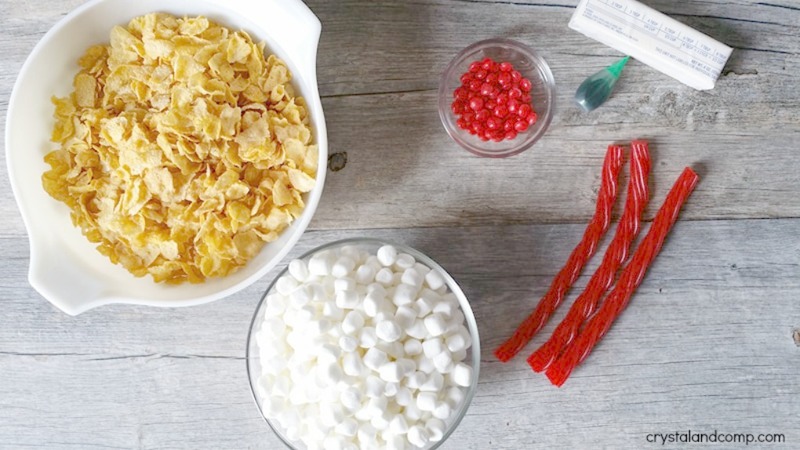 Stir and add in all of the corn flake cereal. Make sure the cereal is coated completely. Since we are dealing with marshmallows and we have to do a little molding for this spray a little non stick cooking spray on your hands. Begin by gathering and making a ball out of some of your cereal mixture. Press the ball you have made onto the parchment paper to make a circle. You can use your thumb to poke a hole in the center and then remold your mixture to make it look like a wreath. You may have to repeat the non stick spray on your hands if you feel they are getting sticky! Add your red hot candies immediately while the mixture is still warm. Make a bow with the Twizzlers to add to your wreath! Are you doing Elf on the Shelf again this season? 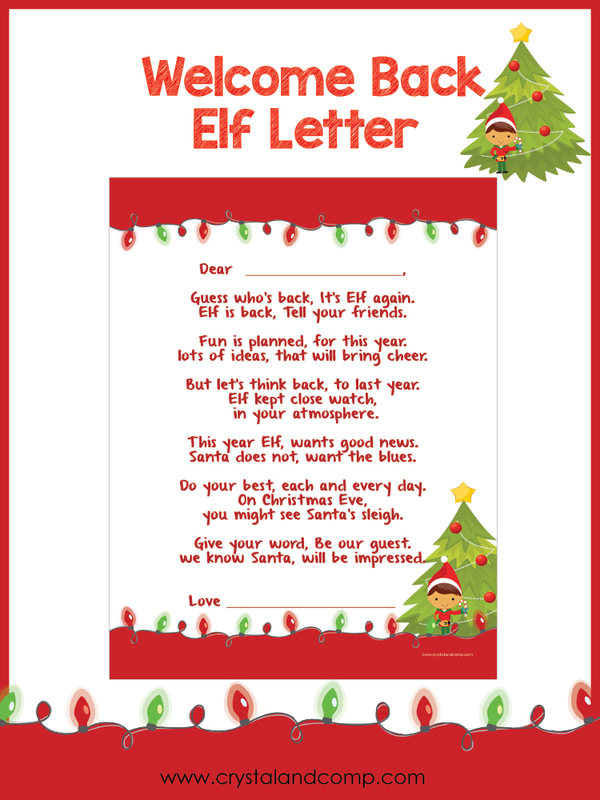 We love this welcome back letter! 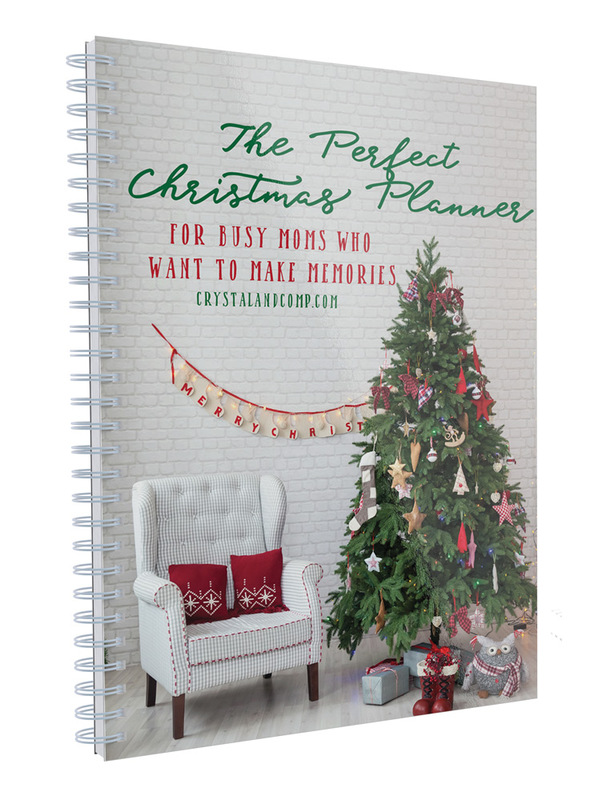 Check out The Perfect Christmas Planner. It is perfect for busy moms who want to make memories with their family this season! Alex is Crystal's sister-in-law (married to Crystal's youngest brother) and mother to three boys. Alex is a longtime reader of Crystal & Co., and holds a Master of Science in Psychology and Behavioral Health and loves studying people and what makes them tick. 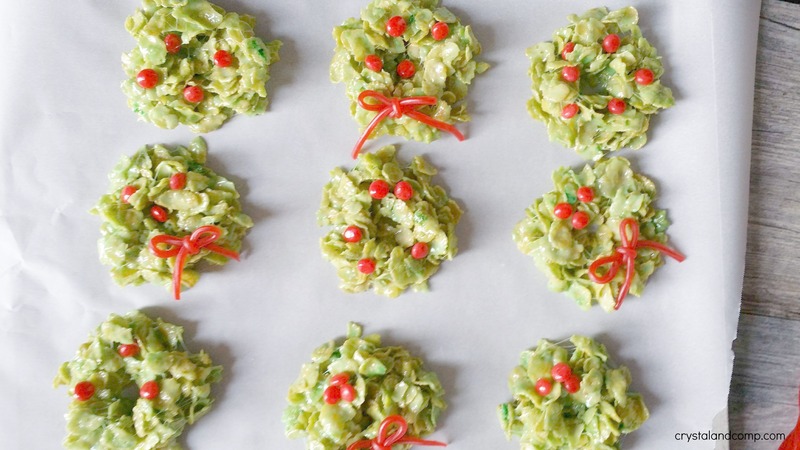 Your No Bake Christmas Wreath Cookies are just adorable and very special! Hope you have a great week and thanks so much for sharing with us at Full Plate Thursday.